It's the last day of May and I'm still trying to finish blogging about April! (Although come to think of it, I still have a post from last fall I never got up, sigh.) For spring break, which was over Easter, we drove up to Idaho to reunite with some friends that had moved away. We had a leisurely drive up, taking two days to do a 6.5 hour drive, which meant we had time for sightseeing. One stop we really enjoyed was the Hill Aerospace Museum near Ogden, Utah. We had been there before, but the kids didn't really remember it. And there's so much to see, it's worth multiple visits. Desert Girl was ready to give a speech. We arrived at a huge cabin that fit all five families. It was hard to call it a cabin! Desert Boy was wiped out and took a nap. Fitting food for a long weekend into the refrigerator took some creative organization skills. Everyone brought eggs, so we had more than enough! It was so fun to chat--often over food or food preparation. We also had fun dyeing eggs. And then on Easter morning the kids had to sit on the stairs and wait to be released. This was one of my favorites--Desert Girl had to rock climb to get to the egg. it was time to eat again. We often ate in shifts. Then it was time for more fun. We really loved Lava Hot Springs, but I didn't manage to get a single photo there. But we spent a whole day soaking in hot water and then playing at the aquatic center. We also built a zipline in the yard and played on that awhile. I took the kids to church in Soda Springs later in the day on Easter Sunday, and we enjoyed the geyser that goes off every hour on the hour. The water is just warm, not hot. It makes some beautiful travertine. On the way back we explored some of the Oregon Trail and also learned about how the lava flows changed the flow of the Bear River. That was something I hadn't really contemplated, and it was fascinating to think about how a big river had totally changed course and stopped flowing to the ocean because of lava. Desert Girl is near the Bear River at some cliffs that were a landmark for the early travelers. The last evening we went for a rambling walk up on the Idaho mountainside. We saw lots of deer. And made our way through a recently burned landscape. I challenged Desert Boy to a race up the mountain. He was feeling energetic, I wasn't, so I just took photos and gave him a $1 for winning. He was happy about that. The kids are learning some good life skills, like how to get through barbed wire fence. These girls would love to spend more time together! It was so nice to visit friends we hadn't seen for many months. Hopefully we can get together again before too long. Meet our new lamb, Whitie! We got him a couple weeks ago, as Desert Boy had signed up to do market lambs for 4-H. 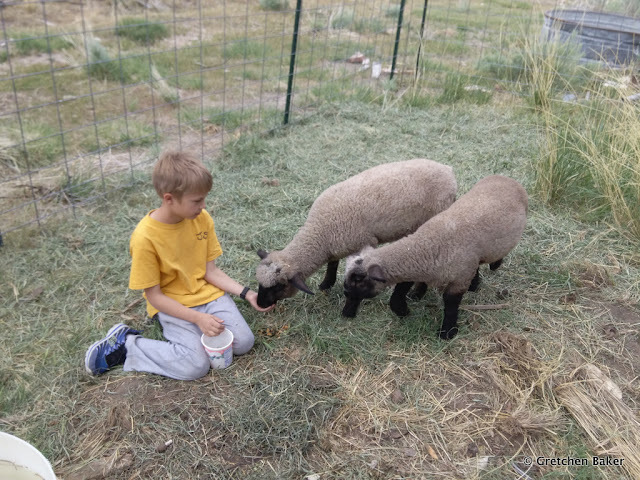 This is his first year in 4-H, and we have a lot to learn! 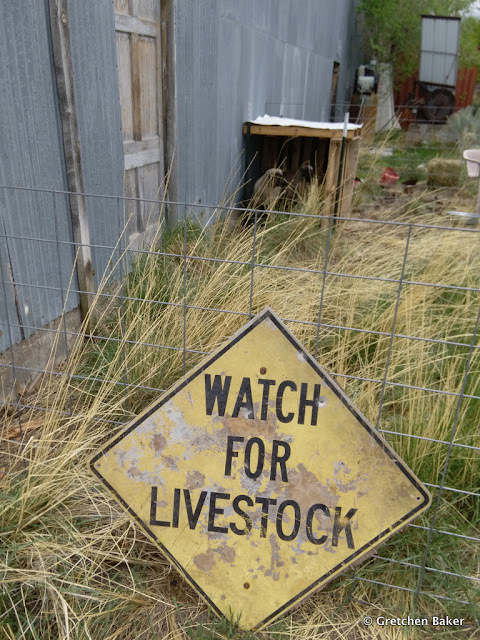 A friend told us where to get lambs that had done well for them in the past. 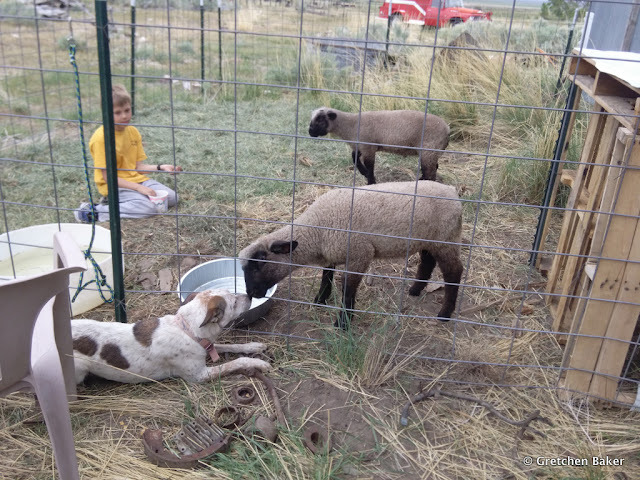 And since lambs are social, we got two, so they can hang out together. It was quite a sight when we unloaded them. My husband easily picked one up to move to the pen. I thought I could too, so I gave it a try. 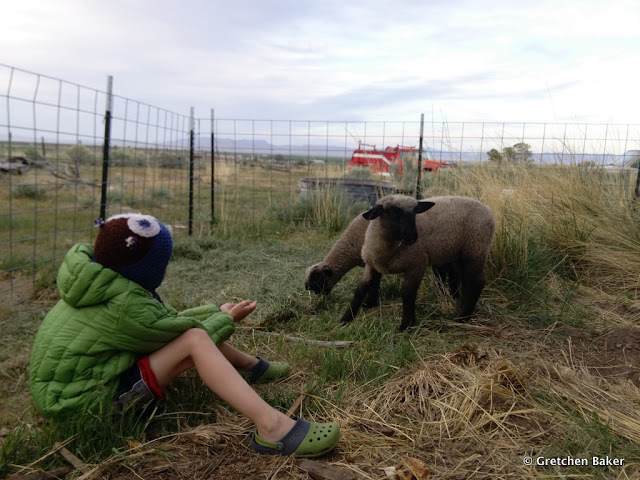 The lamb wiggled out of my arms, past me, out of the trailer, and out into the big open world. Oh, no, how were we going to catch it now? After chasing it fruitlessly for awhile, we left it alone and it went to the other one. Then it was a matter of opening the gate at the right time (first we got the wrong time and had two lambs loose! ), but we eventually succeeded. 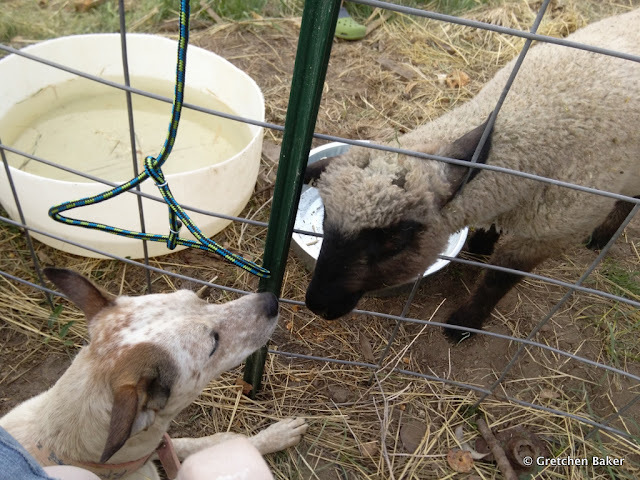 Our new dog Maggie made fast friends with the lambs. 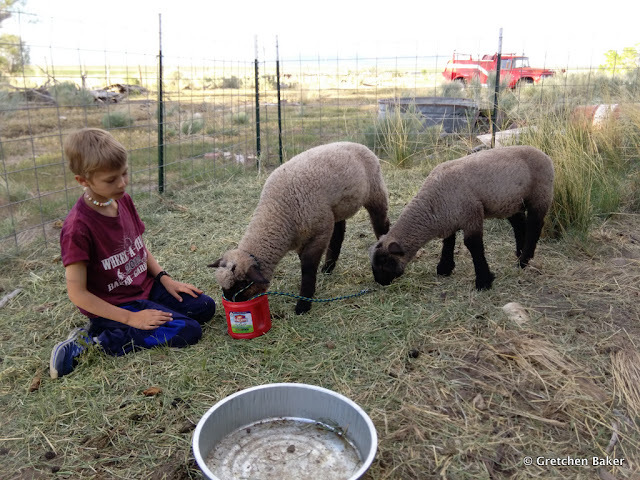 We've been working to tame the lambs, so they've been eating grain out of Desert Boy's hand a lot. Although sometimes they get distracted. They have really sweet dispositions. This sign was near the pen, so I couldn't resist putting it up. Desert Girl wanted in on the action. Desert Boy even got the halter on one day. We have some work to make that easier and start taking the lambs for walks. I'm sure that will be exciting at first! The lambs have been welcome companions. The kids are learning more responsibility. We'll have them until the fair, the third weekend of August. 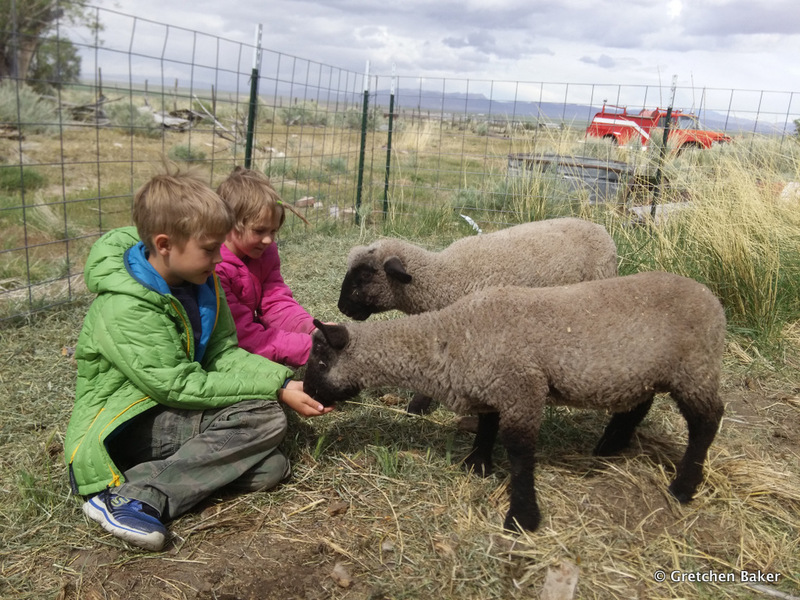 We're all learning more about lambs, and are looking forward to having a lamb expert come live with us for awhile. More about that soon! We've been keeping track of our backyard birds again this year and although we started very slowly (no species observed in February because life got crazy), we've added to our list steadily since then. I feel like the kids are learning the birds a lot better now; repetition helps! The Bullock's orioles came back about two weeks ago, with their noisy chattering making the yard a lot noisier! Above is a female in the golden sunrise. Of course, the birds we see most in our yard are our chickens! We have three grown hens that we've had for more than a year. They are fantastic layers. We got six new chicks in April, and they've grown fast. They spend their days in the run, which is an old swingset covered with chicken wire (including the bottom). They think it's awesome. They spent about two weeks in it during the days, and now we're letting them venture out a little on their own. That big rubbermaid container was their home for the first 10 days in the house, but then they started escaping too much so were moved out to the chicken coop with some baby gates to keep them separated from the big hens. We see kestrels in our yard almost every day. They like the lombardy poplars a lot. I'm not sure if they're nesting in one of them or not--I hope so! The poplars and all the trees in the yard were trimmed this last winter so they will hopefully last a lot longer. We see American robins frequently. And this bird is also frequent. It's not my favorite, as it's non-native, but it is kind of pretty. Do you know it? European starling. The feathers can be very shimmery in the right light. Fortunately we do have native bird species around us. I found this one up the road, a sage thrasher. I don't seem them often, so had to look it up! While I was doing a short-eared owl survey (no short-eared owls out here, unfortunately), I found this northern harrier on a fence post, with the snow-capped Deep Creek mountains in the background. I did find another kind of owl, a burrowing owl. They are adorable (but hard to photograph without disturbing them). We got a new dog from a shelter, and three days after we got her, my husband took her with him to work in the fields in a nearby town. He started a pump, it made a big noise, and she got scared and ran away. We went and looked for her frequently--nine trips! On some of the trips, I photographed birds, as it gave me an excuse to dawdle and hopefully for her to smell me and come back. Here are some red-winged blackbirds. And I was tickled to find a merganser (not sure which kind) and an eared grebe swimming next to each other. The curlews have been back over a month, although we still haven't seen one in our yard. They are so strange looking. I was a little surprised to see this Cattle Egret out in one of the fields. It was a very windy day, so it was hunkered down. The Western Kingbirds are another noisy bird that come into the yard frequently. And I just realized that we never added it to our list. Hurray for #27! The Yellow-headed Blackbirds like being by the agricultural areas and water. I've never seen one in the yard. And as for the dog, we got the word out she was missing, and our friends let us know every time they saw her. She kept running, though, so by the time we got down there, she was gone. On day four we got a call that she was lying in the yard. And this time she stayed and we were happily reunited! Back to birds: We've gotten 35 species in the backyard the last two years, so our goal is to break that number. Hopefully with hummingbirds, night hawks, and more raptors, we might do that! You can see our list on the sidebar to the right. What birds have you seen in your yard lately? The week before the kids' spring break, my brother and sister-in-law from Kentucky had their spring break and decided to come out West. We wanted to meet up with them since we don't see them often, so the kids got to take a couple days off school. After a successful dentists' visit, we headed up onto the Colorado Plateau to the Ponderosa Grove campground near Coral Pink Sand Dunes State Park. It was a great somewhat primitive site, and although there were plenty of spots in the mid-afternoon, by the evening it had filled up. The next morning, Desert Boy tried out his new guitar and entertained us during breakfast. We also made use of the big ponderosa pines and put a rope up in the tree. Giacomo, an exchange student from Rome, got to try out a new technique and loved it. Then it was off to the sand dunes. There were quite a few people there. I really like the rule of no ATVs before 10 am, as it gives you a chance to go out on the sand and not worry about getting run over. The kids' favorite part was digging. They dug and dug, but still didn't make it to the bottom of the dune. From there we went to the nearby Moccasin Mountain dinosaur tracks. We had visited a few years previous, but it's been developed a lot more, with a huge primitive camping area just off the paved road with a confusing network of roads, and then the road leading to the tracks was in better shape than I remembered. We enjoyed looking for dinosaur tracks. With all the changes, it doesn't seem as remote a spot, and we shared it with a bunch of other people on a weekday morning. It is just so cool thinking about dinosaurs walking along here millions of years ago! We climbed up on the rocks and got a most awesome view of the rock layers. This place is gorgeous! After a picnic lunch in Kanab, we went to Peekaboo (Red) Canyon. It turned out to be a great adventure to get there, on extremely sandy roads. We eventually made it in our 4WD pickup. Barely. We weren't sure if we were going to make it out, as it was slightly uphill. We decided not to sweat it and just enjoyed the slot canyon. Desert Girl insisted on getting past this obstacle all on her own. She eventually found a technique that worked. The red rock makes such a nice backdrop for photos! My niece wasn't feeling so great, so she might not remember much, but the photos prove she was there. The slot narrowed enough in some parts to make it rather dark. The canyon was rather short, about a third of a mile until we reached a 20-foot drop that we couldn't find an easy way up. So we turned around and headed back. The drive out was a little eventful, with a patch of really deep sand we almost got stuck in. I don't think I'd go back in a 4WD full size vehicle. We could have deflated our tires to help, but ATVs are better vehicles to get out there. Our next destination was Zion National Park. Zion's popularity has swelled, and they now receive over 4 million visitors a year. We were hoping that by going very late in the afternoon, we might be able to find some parking spots. We saw some bighorn sheep on our drive in from the east entrance. And we found some parking at the Overlook Trail, a trail I hadn't done before. It's just one mile long each way, but it's a bit of an adventure hike, with some steep dropoffs. It provided us with some challenges. And I was surprised how many other people we saw on the trail at the late hour. Apparently they were going to make the most of parking spots too! We all made it to the overlook! I knew of a fun off-trail hike on the other side of the road, but it turned out it was flooded, and no one wanted to wade in the cold water. So we went up to the Zion Canyon entrance and found some parking there and got on the shuttle bus to go up to the Riverwalk. When we got off the shuttle, we found some turkeys and deer. The Zion River was flowing high enough that no hiking through the Zion Narrows was permitted. That was okay with us, it was getting dark and the air and water were very cold! But we still found a rock to go stand on to be in the river a little! That night we had camping reservations for Sand Hollow State Park, but we arrived at 10:04 pm and the gate closes at 10 pm and there's no getting in after that. (If we had known, we would have arrived earlier!). So we spent a very windy night at a BLM trailhead that we called our campsite for the night. (All the hotel rooms within two hours drive were full.) None of us got much sleep, and Giacomo had to take the ACT the next morning. Hopefully he did okay! We played in St. George parks for awhile, my husband and I bought a new used van, and then we had lunch together before we parted ways. It was a fun trip. Southern Utah is very popular in the spring because the temperatures are great and it's so scenic. Although some spots are very crowded, there are places to get away from the crowds, they just take a little work to get to!